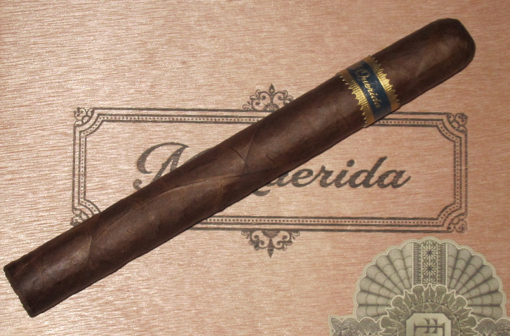 Reviewers, including my colleague, raved about Steve Saka’s debut release from Dunbarton Tobacco & Trust: Sobremesa. Although I enjoyed that cigar, something about it didn’t quite hit my palate right (I consistently found a slight metallic flavor detracted from otherwise excellent flavors). My experience with Saka’s second release, Mi Querida, however, has given me no such hesitations. Made with a Connecticut Broadleaf wrapper around Nicaraguan binder and filler, the cigar produces rich flavors with wood, roasted notes, and just a bit of subtle sweetness. Construction is excellent from start to finish. The Churchill-sized (7 x 50) SakaKhan is slightly mellower than the smaller sizes I tried (more medium-bodied than medium- to full-bodied) but it is highly enjoyable and easy to recommend.